Her record defending the indefensible speaks for itself. 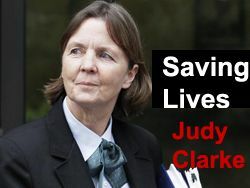 Among those who want capital punishment abolished in this country, Judy Clarke is the most effective champion in history. No person should be defined “by the worst moment, or worst day” of his life. Dzhokhar Tsarnaev just got the biggest gift of his life -- Judy Clarke has been appointed by the court to represent him along with the Federal Defenders. Among the lives Judy has helped save: Jared Loughner, Eric Rudolph, Susan Smith, and Ted Kaczinski. I wrote a week ago that her phone must be ringing off the hook, and I'm so glad she accepted the appointment. There is no one more suited for the task and more capable. More on Judy here and here. Tsarnaev has become the new poster child for "the worst of the worst." If anyone can gain his trust to be able to provide him an effective defense and save his life, it's Judy. Judy rarely talks to the media but last week, she was the keynote speaker at a Loyola Law School conference, and spoke a little bit about being a death defense lawyer. Your client is charged with a crime considered so awful that the entire country hates him. He becomes the new poster child for "the worst of the worst." How do you gain his trust to be able to provide an effective defense? This new profile of Judy Clarke, defending Jared Loughner, in the New York Times, provides some clues. Veteran federal public defender Judy Clarke, who has experience in several high-profile cases including those of "Unabomber" Ted Kaczynski and convicted terrorist Zacarias Moussaoui, was appointed to defend suspect Jared Lee Loughner, a federal judicial source said. They don't make defense lawyers any better than Judy. You may remember her from the Susan Smith case in South Carolina, where Smith was charged with drowning her two sons; or the Unabomber case, or the case of Eric Rudolf. Thanks to Judy (and those who helped her), all avoided the death penalty. She also worked on the Zacarias Moussaoui defense team for a while. The AP called her "a one woman dream team."